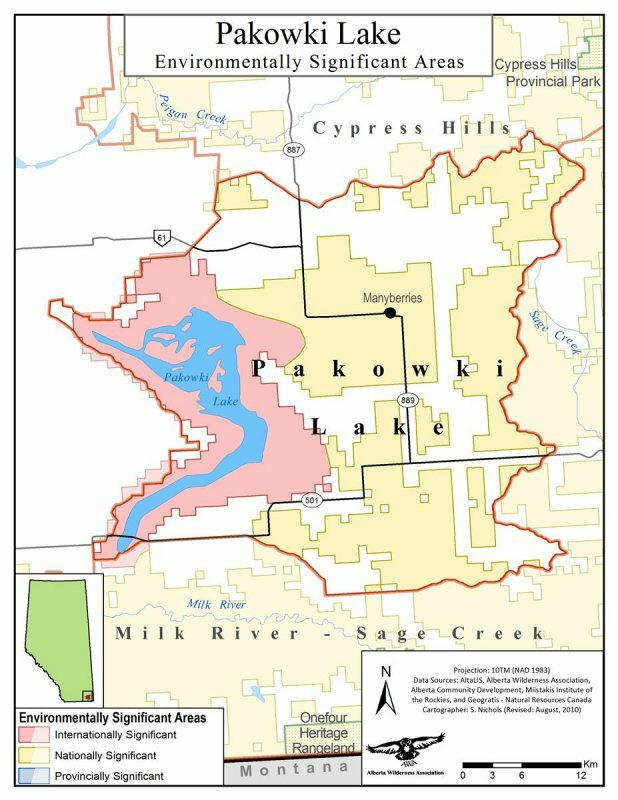 The Pakowki Lake Area of Concern is located southwest of the Cypress Hills and north of the Milk River, in the Grassland Natural Region. An area of national environmental significance, it encompasses the large, intermittent lake itself, as well as the surrounding prairie uplands and a large sand dune–wetland complex, including extensive bulrush marshes. Pakowki Lake is an important staging area for migrating shorebirds and provides a nesting area for birds that occur in few other places in Canada. The area is also important for the rare and uncommon plants found in the sand dune and wetland habitats. A number of endangered species live in the Pakowki Lake region, including the greater sage-grouse, which has been federally listed as endangered since 1998. The Pakowki sandhills are public land held under grazing lease. Some cultivation has taken place on adjacent parcels of privately owned land. 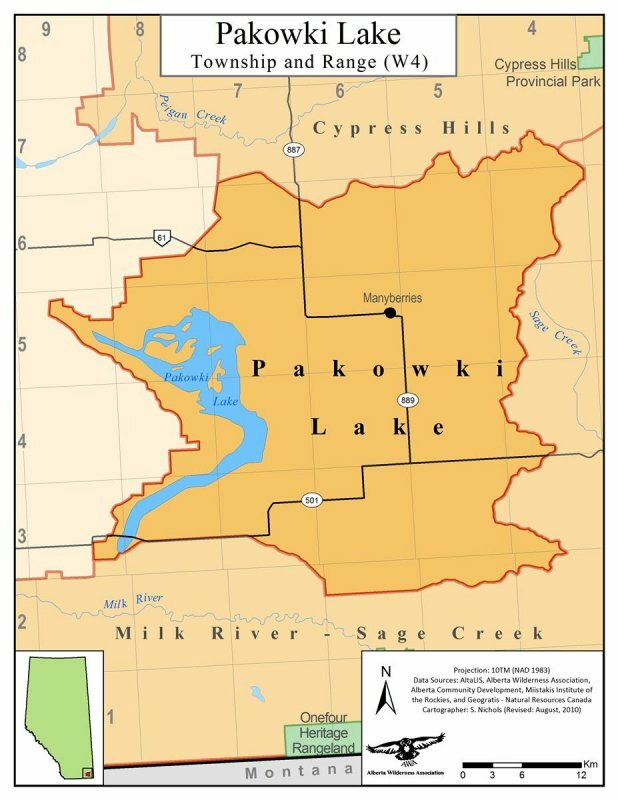 None of the Pakowki Lake Area of Concern has provincial or federal protected status. Pakowki Lake is designated an Important Bird Area (IBA). A site is recognized as an IBA only if it meets certain criteria, based on the occurrence of key bird species that are vulnerable to global extinction or whose populations are otherwise irreplaceable. Selecting an area as an IBA is a way of identifying it as a priority for conservation. It does not convey any legislated protective status. The International Union for Conservation of Nature (IUCN) has classified Pakowki Lake as a Category IV Habitat/Species Management Area, meaning it should be managed mainly for conservation of habitats and biodiversity. Pakowki Lake should be formally recognized for its national environmental significance with legislated provincial protection. It should be managed primarily for conservation purposes so as to ensure the maintenance of natural habitat and biodiversity. 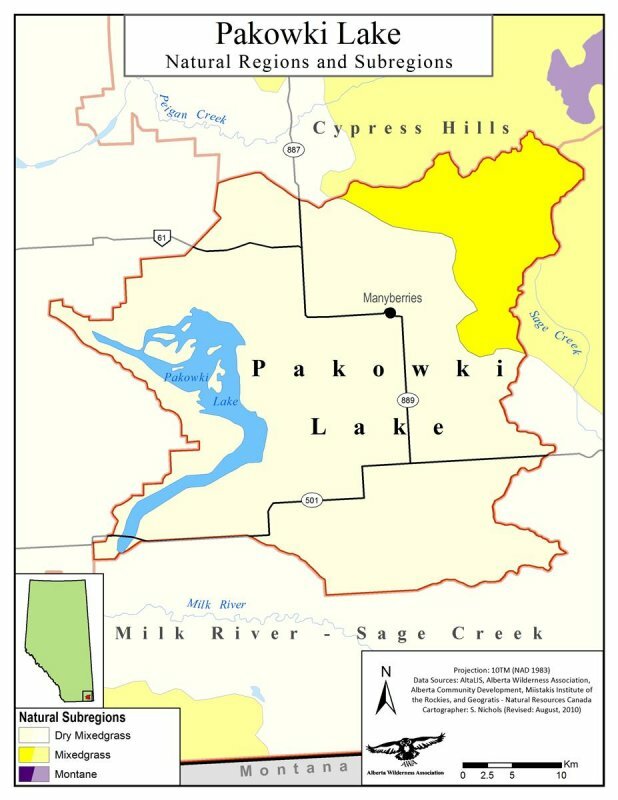 The Pakowki Lake Area of Concern is located southeast of the Cypress Hills and north of the Milk River, in the Grassland Natural Region. An area of national environmental significance, it encompasses the large, intermittent lake itself, as well as the surrounding prairie uplands and a large sand dune–wetland complex, including extensive bulrush marshes. Pakowki Lake is an important staging area for migrating shorebirds and provides a nesting area for birds that occur in few other places in Canada. The area is also important for the rare and uncommon plants found in the sand dune and wetland habitats. A number of endangered species live in the Pakowki Lake region, including the greater sage-grouse, which has been federally listed as endangered since 1998. The Pakowki Lake Area of Concern, located in Alberta’s southeast corner just north of the Milk River, is approximately 1,550 km2. It is contiguous with two other AWA Areas of Concern: Milk River – Sage Creek and Cypress Hills. The area is internationally significant for its shorebird and waterfowl habitat, and was designated an Important Bird Area in the early 2000s to identify it as a globally important conservation priority. Pakowki Lake is listed by Bird Studies Canada and Bird Life International as globally significant for congregatory species and waterfowl concentrations and nationally significant for congregatory species and shorebird concentrations. The lake is a major stop on the western flyway. Pakowki Lake lies within the Dry Mixedgrass Subregion of the Grassland Natural Region. The Grassland Natural Region is the least protected of Alberta’s six natural regions: less than 1 percent of this natural region is protected. The only inflow channel into Pakowki Lake is Etzikom Coulee, which is an impressive glacial spillway channel. The lake is fed only by intermittent streams, and flows out only under extremely high water levels, when it flows south to the Milk River. The striking channels of Etzikom Coulee, Pakowki (or Pendant d’Oreille) Coulee, and others of the region were carved by large rivers of glacial meltwater from the retreating continental glacier. Huge lakes of water were held between the ice-sheet and the higher lands to the west. With the glacier blocking the eastward flow of waters north of Cypress Hills, the waters of southern Alberta flowed southeast and south into the ancient Milk River, a much larger river then. 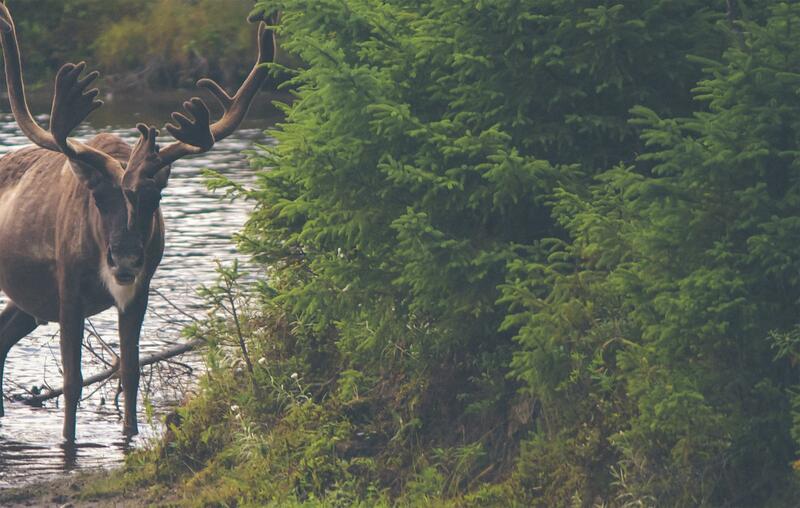 Part of the lake is designated a Provincial Game Bird Sanctuary, which means that the hunting of game birds is prohibited except with a special permit. Pakowki Lake is a significant area for the large numbers of waterfowl and shorebirds found there. The large lake includes extensive marshes and areas of open water. The surrounding uplands are predominantly mixed-grass prairie. The gold-edged gem (Schinia avemensis) is a small moth that is listed as endangered under Canada’s Species at Risk Act (April 2006). It is known from only two small populations in Canada and two in the United States. Pakowki Lake is one of four sites in Alberta in which this species has been found. The Pakowki Lake colony is located on leased, provincially owned grazing land. Habitat requirements are active dunes or blow-outs with populations of its sole larval host plant. Large-scale decline in active dune habitat over the past 100 years has likely resulted in a corresponding reduction in the moth. Habitat loss has occurred because of stabilization of active dunes by both native and introduced vegetation and by overgrazing of its larval host plant. This severely impacts small, isolated populations of the moth. The closest population of the moth in the United States is about 1,200 km to the south in Colorado, so immigration of individuals into the Canadian population is not possible. The Draft South Saskatchewan Regional Plan is officially unveiled. The draft does not address conservation in native grasslands in any specific way; no legislated protection is proposed for grassland areas despite the large number of species at risk in southeast Alberta. AWA takes Alberta Tourism, Parks and Recreation Minister Christine Cusanelli and Assistant Deputy Minister Graham Statt on a tour of the Pakowki Lake and Milk River – Sage Creek areas, introducing them to Alberta’s southeastern grasslands, and many of the concerns AWA has for the area and its management. Also participating in the tour are representatives from the Prairie Conservation Forum. Birders spot a black-headed gull on the northwest arm of Pakowki Lake – the first time this species has ever been seen in Alberta. A wet year leads to unusually high water levels in the lake, resulting in high numbers of nesting bird populations. Many instances of pelicans and Clark’s Grebes observed nesting along roads. A colony of gold-edged gems is found in the Pakowki Lake sand dunes. This is one of four sites in Alberta where this endangered species has been found. Pakowki Lake is recognized as an Important Bird Area. Canada’s Important Bird Areas (IBA) program is a science-based initiative to identify, conserve and monitor a network of sites that provide essential habitat for Canada’s bird populations. The IBA program is an international conservation initiative coordinated by BirdLife International. The Canadian co-partners for the IBA program are Bird Studies Canada and Nature Canada. A dry winter and chinook winds prevent a frost seal from forming on the lake. All precipitation goes straight into the ground. As a result, Pakowki Lake is almost completely dry, something not seen since the late 1980s. A water quality sampling program is implemented by the Water Sciences Branch of Alberta Environmental Protection to determine whether the physical, biological, and chemical characteristics of the lake influence the timing and severity of avian botulism outbreaks. Clostridium botulinum type C, the most frequent cause of avian botulism, is confirmed in Pakowki Lake. It is estimated that more than 200,000 birds die during the most severe outbreak of avian botulism ever recorded in Pakowki Lake (104,000 green-winged teal, 40,000 northern pintail, 20,000 northern shoveler and 16,000 mallards make up 90 percent of the losses). A total of 100,825 carcasses are collected during efforts to control the outbreak. Continuous clean-up operations from July 17 to October 18 involve 54 people and require 4,800 person-hours of work. The Pakowki Lake Working Group is formed, with the goal of investigating and implementing methods of limiting avian mortality at Pakowki Lake. An outbreak of avian botulism occurs at Pakowki Lake, killing more than 100,000 birds. Similar outbreaks have occurred in the past, including in 1980, 1975, and 1928. A single white-faced ibis is photographed at Pakowki Lake – the first authenticated sighting of this species in Alberta. Pakowki Lake is designated a Provincial Game Bird Sanctuary. The Alberta government gives permission for the export of natural gas from the Pakowki Lake area to Butte, Montana. The international (U.S.-Canada) Treaty to Protect Migratory Birds is signed by the Dominion Government. In order to protect North American waterbird species, which were decimated through uncontrolled commercial hunting for the food and feather trade in the late 1800s and early 1900s, Canada protects Pakowki Lake, along with 13 other Alberta lakes and 12 Saskatchewan lakes (Northern Prairie and Parkland Waterbird Conservation Plan 2004). A federal ministerial order approves federal reservations on “all the vacant quarter-sections immediately adjoining the following lakes in Saskatchewan and Alberta, with a view to the future establishment of permanent bird reserves.” The order withdraws 14 lakes in Alberta from settlement, many of which are subsequently established as reserves, including Pakowki Lake. Federal Migratory Bird Officers and provincial Game Guardians are hired to administer them (Fish, Fur and Feathers, Chapter 8). The Blood First Nation, well-known traders of both the American Fur Company and the Hudson’s Bay Company, move south into the Pakowki Lake.